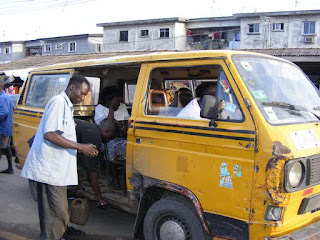 Every minute spent in a public transport in Lagos gives you unique experiences about life. The memories are meant to be forgotten and only to be recalled when you are smiling down on it from the top because of the awry nature of the numerous occurrences. Imagine the look on the ever angry-looking conductor when you offer him a sum of N500 or N1000 for a payment of N50 after he must have given you a prior warning before boarding the bus. This could lead to undue attention in the vehicle. This is paramount to our ''mommies'' in the in the trading business especially the Igbo women selling Okporoko, Ugwu leaves and other soup ingredients. Some even ooze like they bathed with locust beans. My major problem is that they will always interfere in all issues and this circulates the odour. The morning period is the time the traders dealing in food materials go out to purchase their merchandise for sale. Imagine someone putting a bag of crayfish on your leg when you are heading to work corporately dressed on a serious day like a Monday. Hmmm! It’s easier to doze off in a lag bus after waking up too early or being stressed at work. It’s too embarrassing to wake up and find yourself around another strange bus top. The bus conductor could as well collect an extra pay for the service. It would be far from being funny when you discover the passenger close to you is a bus preacher who shouts on top of his voice to preach the word of God. I once listened to someone who preached with a Calabar accent. It was like rapture was imminent. That awkward moment when you dip your hands into your pockets very close to your bus stop and realise the money was issued a Visa by one pick pocket and it flew away. The funniest part is that the conductor would think you are trying to con him. This is common among conductors plying the Festac-Mile 2 route; they rush you for payment while anticipating the grid-lock and then quietly disappear as a way of tying you to the bus throughout the stressful bad traffic. One woman once squeezed a small goat into her Bagco bag and entered the bus, half way to her destination, the kid cried aloud in discomfort as she tried to suppress the animal. Everybody was shocked! What about a fish seller that enters with her goods after a stressful day selling? That's an unwanted but most dominating air-freshener. Events could take a dramatic twist when some conductors either purposely or forgetfully demand payment from you two times. This could lead to a bitter argument that will be unpleasant to one cute working class lady you are eyeing in the vehicle. A conductor once asked me for money 5 different times after I had paid him. Plus-sized women are like the nightmares of passengers and conductors. Some full-time house wives could be so full-figured that they will occupy the seats of three slim people in the vehicle leading to a controversy and discomfort of the passengers. Some women with some 'ikebe' sizes really need to go get their own private vehicles for the sake of peace. Thanks for reading thus far; I am the Village Town Crier. This is to lighten up your mood. Everyday isn't for bitter arguments about politics.